After several glorious vacation days in Ohio with Godson to visit my family, I can honestly say I spent every second totally and completely intoxicated-- With baby love. Yeah, yeah, yeah, I'm smitten with my sweet, nearly seven week old, great niece and I promise not to gush too much about her, but please indulge me (again) for a moment. Oh the smell of a new baby-- It's delicious and I drank it in every chance I got. Despite mumblings about being a "baby hog", and "Auntie monopolization", I had my hands on our happy, nearly 8 pound little girl every change I got-- Or when Godson wasn't *ahem* hogging her. And let me tell you, Godson was amazing and held her every change he got. Little Miss is the first baby he's known, and he was a natural baby lover, I'm happy to say. It was a grand vacation that re-energized my soul, lifted my spirits and has me aching to go back again before the snow falls, which in northern Ohio means before mid-October to be on the safe side. Our vacation was jammed packed with everything from cow milking, ice cream eating, marshmallow roasting, water balloon tossing, puppy dog walking, and baby, family, and more baby! And by the way-- S'more made with Reese Cups instead of just chocolate are to die for! Then, when I returned to Los Angeles, overloaded with homesickness for Ohio, I had a beautiful photographic package waiting for me from the lovely Christina at the amazing Soul Aperture. I was lucky enough to win her recent giveaway. 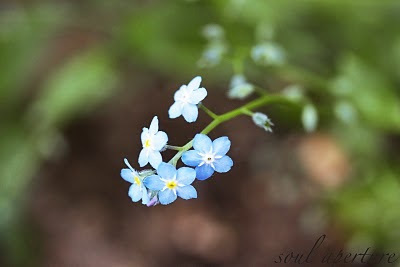 This delicate photo of Christina's-- her sweet little blue flower-- Is a flower that I grew up seeing in Ohio and that fills my folk's side yard to this day. Having Christina's generous gift waiting for me on my return was a treat beyond words. If you don't know the beauty of Soul Aperture, please stop by and say hello. You'll be glad you did. Now that I'm back, I'm unpacking, regrouping, and catching up on the biggest stack of mail I've seen in a long time. But, I'll be reading and catching up with everyone over the next few days. I missed you guys! Photo Credit: Blue flower - Christina Soul Aperture - Don't even think of taking it without her permission! Joanna, it sounds like you were in heaven! Ohhhh, Joanna, she is beautiful and the smile on Godson is priceless. I can understand why you wanted to hold her all the time. You know that Godson will not let you go without him! Welcome home! Oh I am so glad you had such a wonderful time. love the smell of a baby, she is beautiful and Godson is a handsome young one. Love the photo Christina sent to you. I lucked out and have a beautiful rose picture from her...well I hope you get some rest and everything will wait, except those smors....lol....no I really won't. hugs to you. glad to hear you had such a wonderful time. I am so happy for you, having such a good time in Ohio. Between many endings, new beginnings a beautiful to watch. My niece just had a baby a couple of weeks ago, and one of my very dear sister-friends had her newest little one today. My brother and his wife are due in ten days. I have to be honest--although I am deliriously happy for all of them, I am still wishing we had just one more little cherub in this household as well! Welcome home Joanna. You've been missed too. Sounds like your visit was wonderful. Reconnecting with family is always good for the soul. And thanks for the tip about the S'mores with peanut butter cups. Welcome back! Looks like your visit was great. It's always great to meet up with family. The baby is very cute! I don't know who is the most adorable, baby or godson! I understand totally that intoxicating baby-scent, you just want to breath them in, don't you? Welcome home hon, we missed you! and why have i never thought of smores with resse cups...that sounds amazing! S'Mores with Reese cups!!! Boy does that sound decadent. I will have to give it a try for sure! Glad your enjoyed your visit. What I'm up to right this very minute is wishing you were my godmother! And that little blue flower, I believe, is a forget-me-not. So appropriate for a return home from a fabulous family get together!! I'm so glad your spirits were lifted. A new baby and a good time with family is a good way to do that, not to mention s'mores with peanut butter cups. Sounds like the trip was good for both you and Godson. As well as the treat for you family in Ohio getting to be with you both for awhile. Nice way to get acquainted with the new baby too. Good for you to win the giveaway. Nice to come home to a gift like that. Hugs to you and I look forward to hearing all about your trip. I love the look on Godsons face while holding that sweet baby! The flower photo is so beautiful! I can certainly relate to the baby intoxication! Your great niece is just one week younger than my darling grandson! Your vacation sounds wonderful! I could certainly use one like that! As much as I like Reese Cups, especially the dark chocolate ones, I cannot believe I never thought to make S'mores out of them! Glad you are back and that you had a wonderful vacation. You might want to stop by when you get a chance today! The baby is precious and your godson is adorable! Welcome back! Oh, new babies are my most favorite thing in the world. Newborns, just nothing like them. Unfortunately, there won't be any new babies in my family for many years to come. I remember when our third was born and our second, was holding him. He said, "I love the new baby. I'll miss him when he goes home." It's impossible for me to read this and not smile like a loon all the way through. Welcome back! I missed you. I'm glad you had such a great time. New babies are a joy. It's when they get older the trouble begins...! I absolutely believe that God gave us babies to fill our hearts with love and inspire us. Very few things inspire us more.What a gorgeous girl she is!!! Ahhhh, the sweet new baby smell....I have to say I am just a teeny bit jealous! Joanna, she is simply a precious bundle of joy. I'm so glad you and Godson had such a wonderful adventure together. I'm sure it's a trip you both will always remember. Oh what a couple of sweeties... that's a wonderful photo. I'm glad you had a fine time of it. There's nothing like a new baby to renew the soul. The Forget-Me-Not image is lovely. There is something about a baby that can bring a smile to your face especially when you love them so!!! Glad you had a great time!!! Wonderful to have you back, Joanna. Sounds like a lovely trip. The top of a baby's head is the best. The photo of your Godson holding your great niece is so very lovingly sweet. I really like what you wrote about his love for the baby. She is beautiful and I am glad you had such a wonderful time. What a precious photo! And how wonderful to get back to your "roots" and the basics. I bet it is a far cry from what you are use to at home. I do hope you get to go back before the snow flies. Maybe for fall colors?? BABIES! eeeee now I want one...well not of my own, but one to play with. S'mores with reeses..the mind boggles and the mouth waters. And, a beautiful photo...the flowers are pretty too. Reese's cup s'mores...that is genious! And that vacation sounds wonderful. Did her head smell like cantaloupe?? That's one of my favorite things about babies. What a cute picture. Sounds like you had a good time back home. It's always nice to have a place to go to that reenergizes you. so glad you had a wonderful trip. it sounds lovely. you're making me blush. : ) enjoy the photo, my friend. No matter where you are from, it will always be home. You can live your entire adult life away from that place and still always feel like you are comfortable whenever you return. and how sweet is your godson and the fact that he was hogging her, too ? s'mores with peanut butter!! Now, I could get into that! Your photos are priceless and it sounds like your trip home was everything wonderful plus more! Just got back from a visit to Kansas. I get it!! Looks like you had a fabulous time. No wonder you wanted to hold her all the time, she's so sweet! What a lovely Godson you have. I loved the photos of him getting his face painted. She is a doll...and I love that he is so smitten. Too sweet! I've come from Robin's, down under, surprised that we have similar friends, but have never met. I lived in L.A. for decades too; something else we have in common. You are still in the rat race though. That, I gave up seven years ago and moved north to Oregon. Glad to meet you. Up to nothing but "heat" and more "heat" Having to stay inside. Darling baby. They are so special. What a bunch of cuties! All of you! I ADORE wee babies too... and here's a wee secret... I am going to be getting another wee grandbaby in 7 months! Woooo Hoooo! I too am a great aunt to a baby girl and I completely understand the passion. Hey I know you have been making the blog rounds and you have a long list. I just want to tell you that I started a special blog that could end up providing blogging info. I say 'could' because it really depends on the readers. I remember your 'How to blog' series and since you have plenty of good knowledge it would be great for you to stop over and share some.